The world is not fair. It is extremely unequal. Some people get everything and others nothing. You know what the craziest part about this is? As absurd as this may sound, there is a phenomenon, rather “principle” to describe this, The Pareto Principle. If I change my opening statement to, 20% of the people get 80% of everything and the others only 20% of everything this statement becomes a perfect example of Pareto’s Principle. It may be clear already but the Pareto principle basically states that, for many events, roughly 80% of the effects come from 20% of the causes, and hence is also called the 80/20 rule. I realize that so far this may be ambiguous. So let’s explain this the classical way, with examples! But nonetheless, that was the first actual example of the Pareto principle. Afterward when he realized that his “peapod example” wasn’t enough he moved on to more material things. He showed that 20% of the people owned 80% of the land in Italy (yes the guy was Italian. A mathematician who isn’t Greek? What a minority!). People started to believe him. The principle still stayed as an underappreciated one. But this all was back in 1896. But as time passed and more data became to be analyzed, the principle became more important and evident. Quite obviously figures like this come as a surprise. But on closer inspection, it is just math. It’s the Pareto Principle. So the next time somebody is criticizing this difference just tell them it’s math and tell them to read this article on our website. We definitely don’t self-advertise. The beauty of math is there are no exceptions. This also holds true for the Pareto principle. Every large set of data having a comparison between two things ‘x’ and ‘y’ will show that 20% of x is directly linked to 80% of y. 20% of software bugs are responsible for 80% of crashes, glitches, and malfunction. 20% of hazards cause 80% of injuries and accidents. 20% of the people win about 80% of the awards. 20% of patients use up 80% of medical resources. 20% of criminals commit 80% of crimes. 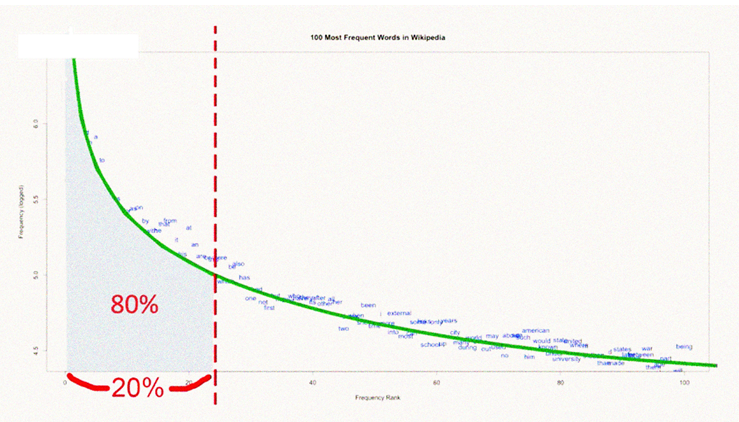 As the image shows 20% of words account for about 80% of the word usage. 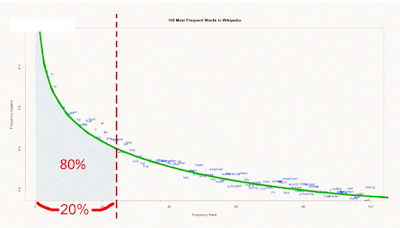 So if you see closely, quite logically Zipf’s law is in part responsible for Pareto’ Principle. Math is interlinked. That is what makes it so easy and hard at the same time.